Every Fourth of July, I reread the Declaration of Independence. We believe that all men are born equal: a statement of principle and of faith that continues to evolve as the moral arc of justice has progressed. This year -- as inequality threatens the fabric of the United States and so many countries around the world -- may we all, wherever we are from, recommit to the idea of human equality, of freedom, of dignity. It is this same commitment to equality and dignity that pushed Acumen to recently open our doors in Latin America, one of the most unequal regions on earth. Beginning in Colombia, our investments will focus on post-conflict areas, where social enterprises not only impact incomes but can also rebuild the social fabric. In Colombia, for example, a half-century of fighting and unrest has left more than 200,000 dead and 5.7 million displaced, fraying the fabric of trust. More than 12 million people live on less than $2 per day, most of them residing in rural areas still threatened by violence, corruption and drugs. This is the poverty of exclusion, reinforced by a geographic terrain that isolates Afro-Caribbean communities along the coast and indigenous communities throughout the country. We have a long history of working in post-conflict areas, from GADC in northern Uganda to Husk in the Naxalite areas of Bihar, India, and see Colombia facing many of the same challenges. The country's post-conflict areas have been cut off from opportunity and prosperity for 50 years. Most are still caught in the violence and impoverishment that grows in barren fields of searing mistrust and an inequality that leaves the poor left out with few prospects for change. Our initial investments in agriculture, energy and education, generously supported by USAID, will focus on bridging that divide and showing what is possible in places hard-bitten by the violent poverty of inequality. Our newest investment, Siembra Viva, connects Colombian smallholder farmers selling organic produce to customers in cities through a logistics and e-commerce platform. As more consumers want to understand and shorten the chain from farm to table, Siembra Viva has the chance to link households directly to the farmers growing their food in a way that benefits all stakeholders, not simply shareholders. In May, I traveled to Tumaco, a coastal area cut off from Bogotá, the country's prosperous cosmopolitan capital, that has paid a heavy price for too many years of violence. The scars of conflict run deep here. Our driver Angel tells me of his fears for his children. He worries about leaving them alone at school. "I tell them not to talk to strangers or touch anything," he said. "Here, there are too many landmines, especially where the drug dealers want to keep people off their land. So we have no choice but to take away our children's freedom." 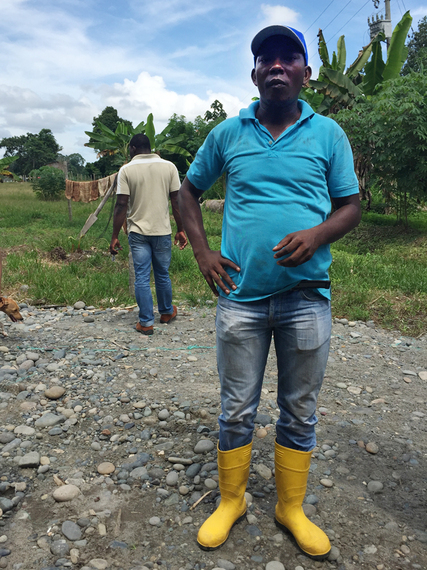 Despite these fears, the people of Tumaco long to let go of a past that does not serve them and focus on a future with possibility. They yearn for change -- and are willing to work for it. When visiting an investment opportunity that sources cacao from smallholder farming associations, I met Oberman, a 32-year-old Afro-Caribbean Colombian who oversees one of these associations. The local farmers collectively dry and sell their beans to high-end chocolate producers, and Acumen's potential investment would focus on creating a more robust supply chain while enhancing incomes and reducing poverty. Oberman listens to our vision and says he is proud to be a part of it. "We need to build a business that takes care of our people and the land -- and shows the young men who grow drugs that another life is possible. Because of this, we cannot fail." It's now July, and I cannot get Oberman's steady, strong and serious gaze out of my mind. A leader who represents his people with confidence and grace, he embodies the principle of human equality by treating no one above or below anyone else. There is much to learn from him -- and even more so from Latin America. Working in the post-conflict areas of Colombia also sheds light on the vulnerability of people living in fragile social and economic systems. Just last week, the FARC, the country's oldest and largest guerilla group, blew up an oil pipeline in Tumaco. The worst environmental disaster in a decade, the spill diverted more than 400,000 gallons of crude oil into nearby rivers and streams, impacting the lives of some of Colombia's most vulnerable communities. It is a reminder that true freedom and dignity, which are at the core of our work, includes not only freedom from economic hardship, but also freedom from violence and insecurity to live and flourish by one's choices. It also reinforces the importance of expanding our work into Latin America, not only to impact lives directly but to be part of a region that has the capacity to show the world what it takes to heal societies using the tools of patient capital, moral leadership and strong management to tackle some of the toughest issues of our time.